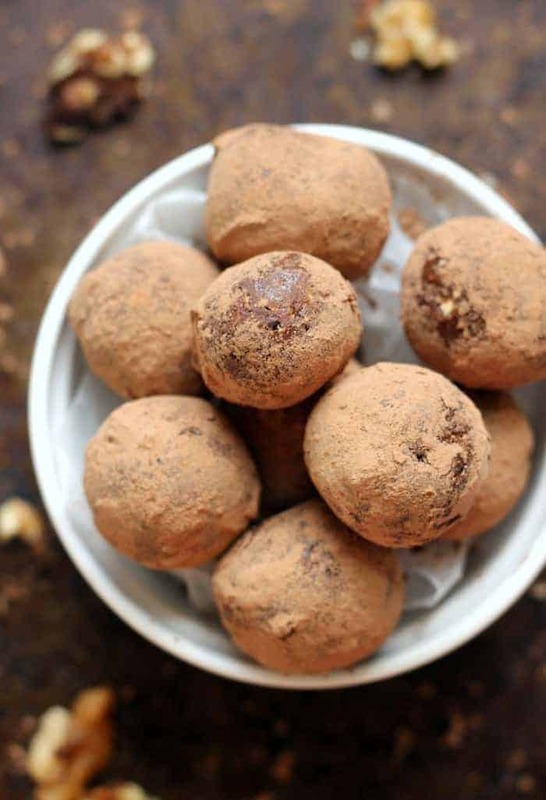 I am so freaking excited for you to sink your pearly whites into these insanely decadent and divinely delish bites of vegan and gluten free chocolate glory! 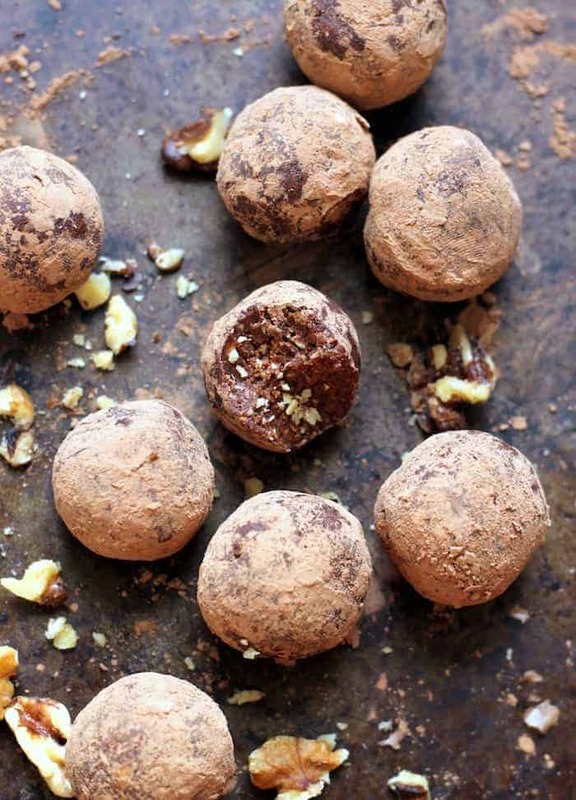 It’s like a no-bake bite meets a chewy, spicy dark chocolate cookie meets a truffle meets hot chocolate. Except they’re not hot. But they have that crazy good chocolatelyness, if you will. You know what I meeeeeeean. I’ve posted a fair number of no-bake bites on the blog. I had a phase where they were mostly made with coconut flour and protein powder. While those are fabulous and have the texture of cakey perfection, I realize that those aren’t ingredients everyone has in their kitch. These dreams (cue Heart’s 1985 one hit wonder) are made with wholesome pantry staples that you likely already have on speed dial like oats, walnuts, and cinnamon. Using a mixture of oats and walnuts rather than entirely nuts makes these a bit lighter, which we can all appreciate considering the fact that they’re addicting. I dare you to eat just one. They’re also super quick and easy! 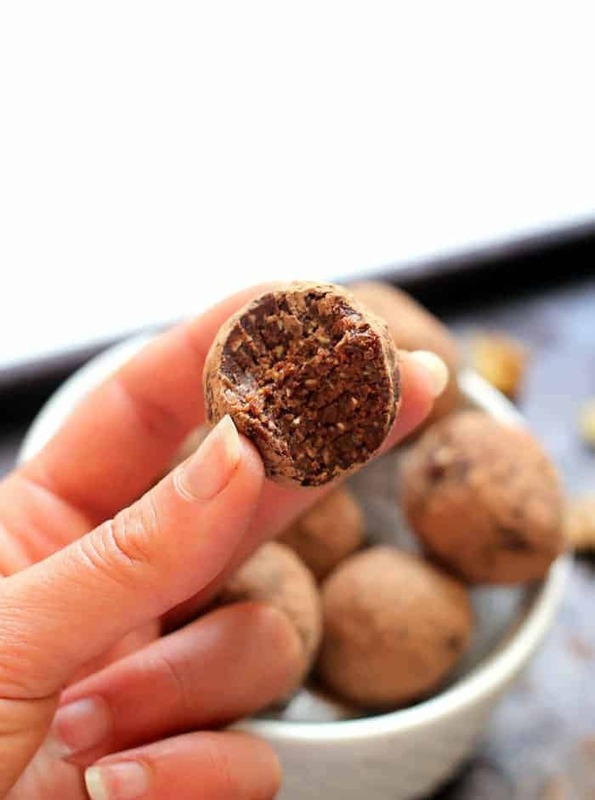 The best part about these Raw Mexican Hot Chocolate Truffles is that they’re totally vegan, gluten-free, and void of refined sugar so they double as a baller snack or satisfying post-dinner (or pre-dinner?) treat. And if you want to eat them for breakfast, that’s just dandy too. Packed with wholesome pantry staples like oats and walnuts, these quick and easy no-bake bites make a tasty afternoon snack or dessert! Place oats and walnuts in the bowl of a large food processor. Process until well-combined. Add dates and process for another minute or so, or until well combined. Roll into about 14 bites. 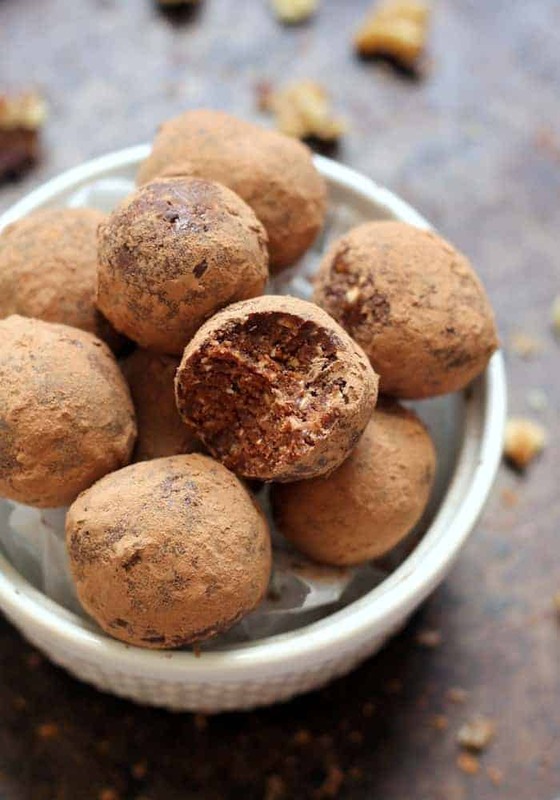 Roll each bite in coca powder. Store in an air-tight container in the fridge or freezer. I like them best from the freezer! As a friendly remember, you have under May 16th to take advantage of early bird registration for the Food Entrepreneur Summit, a series of podcasts to help inspired individuals move forward with their business goals. Along with 17 other amazing women, I’ll be teaching and sharing my story about how to run two businesses and stay sane while doing it! This is an amazing opportunity to connect and learn from other entrepreneurs, like Jessica from How Sweet It Is, Lee from Fit Foodie Finds, Davida from The Healthy Maven, Ali from Inspiralized, and many other incredibly inspiring people. You’ll learn about monetization, affiliates, the comparison trap, content calendars, running a business, AND you’ll have the opportunity to connect with all the speakers! When you participate, you’ll receive access to all seven days of interviews live PLUS get the downloadable versions that are yours forever. See you there! These looks amazing! So excited when I saw them on your snap yesterday. And you photography skills are getting so good!! I need to get to your level haha. LOVE that these are made with oats. I used to use coconut flour because I thought that’s what people wanted buuuuut I came to find that a lot of my readers prefer “regular” flour, so now I stick to whole wheat or oat flour! Anyway, these look awesome DUH. These are definitely going on my list of things to make this weekend. Thanks for the great recipe! And by the way, Heart is not a one-hit wonder band, thankyouverymuch. That’s just a stab to my 80’s band loving heart (ha!). Hmmmm I wonder if I grind up steel cut oats it will work. I need to get rid of food in my pantry! Mexican hot chocolate is DOPE. Thanks for the awesome recipe! These are lovely! After giving up refined sugar, dairy and gluten, I am always on the hunt for treats that I can have. I made these for Christmas, and they were wonderful! I love the kick that they cayenne pepper gives them. Not overpowering, but just enough. The texture is wonderful, and I agree – out of the freezer is the best. (Note: I used Almonds instead of walnuts, and subbed fresh squeezed orange juice for the Almond milk). They were excellent! a very common problem which is why folks are searching for some reliable and cheap electrical source. this is they get several advantages through them. This generator is very simple to install in your home in the limited place without disturbing the original settings of your dwelling. power generator is just not high in any respect. to installing this generator, and that means you won’t need any maintenance from some expert. at regular intervals. This is the most ideal thing to put in your home being a electrical source. It can hold the energy sufficient to handle each of the appliances from the house. A family of four years old to 6 is incredibly ideal for this sort of energy generation device. not need any solar technology or wind. It will develop its very own with no source of external natural energy. Weather is not going to get a new performance or generation of your energy from this magnetic generator. As it doesn’t depend upon any external source so this would be an uninterrupted supply of power generation. Made these last week to bring on a road trip. They were the perfect snack/dessert pick up me! Super easy to make and guilt free!